Best TV Buying Guide: settle in for TechRadar's round-up of the best TV sets you can get your hands on in 2019. Although it's still early days for 2019, we can already tell that this year will be one of the best for TVs. We caught our first glimpse of this year's futuristic flatscreens in early January at CES 2019 and walked away impressed with all the new tech Samsung, LG and Sony have cooked up for us later this year. The first of these new screens, the Samsung Q90, is already available now, and it's an early contender for TV of the year. While we expect LG to arrive with a vengeance with its lineup of 2019 OLED screens in the next month or two, if you want something right now, Samsung's the way to go. If you've got your mind made up to buy a Sony, Vizio or LG from last year, however, that's totally fine. Below you'll find our list of the best screens out right now, along with their key specs, while the second page will teach you more about what makes a TV tick and why those specs matter so much. 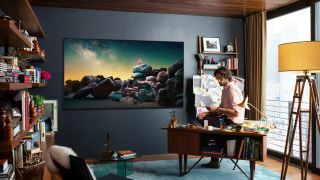 Editor's note: While every TV on our list offers both a 4K resolution and High Dynamic Range (HDR) support, we also have a list specifically tailored to those features in the form of our best 4K TV 2019 list. But while doing so will certainly net you a larger screen at a better price, some of the best panels are already being manufactured today. While tomorrow's screens might be a bit larger, a bit brighter and a bit cheaper, today's screens are just as competent in their own right. We can say that with confidence knowing that most manufacturers have finally embraced the three most important standards in TVs: Ultra HD, Wide Color Gamut and HDR (HDR10 and Dolby Vision). If a TV you're looking at doesn't support at least one of these, you should probably look somewhere else. At the top of our list for 2018 is the LG C8 OLED – available in both 55 and 65-inch iterations. It's here because it combines an impressive picture, an extensive set of features, an attractive design and its unrivaled smart platform, to deliver one of the best TVs we have seen to date. It’s not as bright as an LCD TV but those deep blacks make a huge difference to the dynamic range of the image. It’s also capable of vibrant and gorgeous colors, not to mention an astounding level of detail with native 4K content. There are other OLEDs worth considering this year (see: Sony's A1E and A8F OLED or LG's own E8 and W8 OLED models) but we think the OLED C7 offers the best price-to-performance ratio of any TV under the sun in the year 2018. Samsung's best TV ever? It certainly was! After an underwhelming debut, Samsung’s QLED technology really needed to bounce back in style in 2018. It didn't surprise us in the least, then, to discover Samsung threw the kitchen sink in with its new Q9FN QLED Series of TVs. As well as being even brighter and more colorful than last year’s equivalent model, Samsung's 2018 flagship screens use a completely different lighting system to combat its predecessor’s contrast problems: Full Array Local Dimming rather than edge-lit LED lighting. The FALD panel works in tandem with Samsung QLED Quantum Dots to produce a picture that's brighter and more colorful than near any we've seen come from the South Korean manufacturer. Do those features alone make Samsung Q9FN the best TV on the market? No, but throw in technology like HDR10+ and Q HDR EliteMax – what Samsung bills as its maximum High Dynamic Range experience that’s exclusive to the Q9FN – and there's very little doubt in our mind that this was Samsung's best TV ever until the Q90 came along. With most people - *cough* content providers - only just getting to grips with 4K resolution, you’d be forgiven for thinking that Samsung had gone nuts by introducing the world’s first true 8K TV. And yet, while it's easy to be critical about the Samsung Q900R, it truly does usher in a new era of TV picture quality. So why isn't it higher on our list? If you watch the TV from an angle, color saturations reduce, and backlight blooming becomes much more noticeable. Also, Samsung’s Auto motion processing system is a bit over aggressive, causing too many distracting side effects for comfort. OK, so you don't want (or can't afford) Sony's new A9F OLED or the fantastic-but-pricey Z9F. So what should you buy? Check out the X900F series. With superb 4K image clarity, powerful SDR-to-HDR remastering, and a smooth direct LED backlight, Sony is offering something very different with the X900F. We loved the consistency of its images, the eye-popping vibrancy of its wide color gamut panel and its easy-to-watch HDR – you get spectral highlights without accompanying eye fatigue.